XPS is the abbreviation of XML Paper Specification. It is a page description language that will (in theory) output a fixed-format document complete with page layout; think of an XPS file like a PDF or PostScript file where the page layout remains exactly as specified in the original editing software: unlike a Word or Rich Text Format document where the interpretation of page layout can change drastically from editor to editor. Use the Microsoft XPS Viewer (the XPS equivalent of the Adobe PDF Reader), then you should be able to read any XPS file on any Windows machine. Mostly. XPS also includes support for other features that you'd find in PDF, like digital signatures and DRM. OXPS followed as a standardised, open format - Open XML Paper Specification - in the same way Office Open XML is an open, standard format for Microsoft Office documents. Every Windows version since Vista has included an XPS printer driver equivalent to a 'PDF printer'. 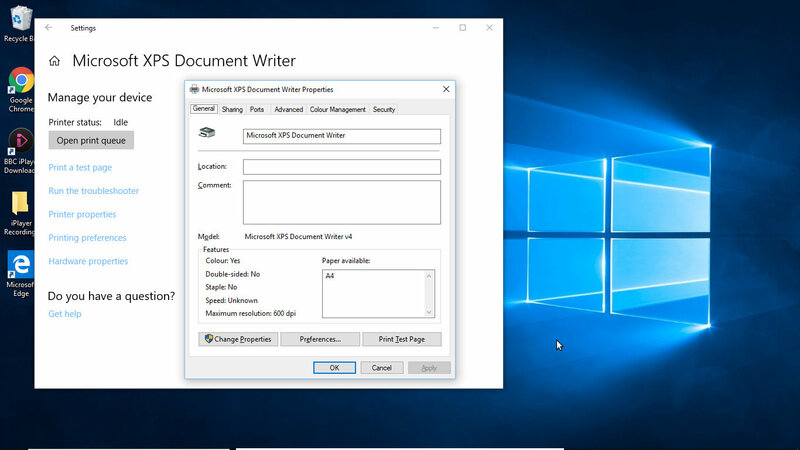 It's a virtual print driver to render documents in XPS format files, one of those supposed 'write once, read anywhere' formats that renders in any XPS Viewer. Unless you're still on Vista or Windows 7, where the earlier versions of XPS Viewer pre-date OXPS formatting and don't know what to do with OXPS files. The short answer is don't. XPS was designed as a 'PDF killer' to break Adobe's PDF monopoly, when Microsoft thought everyone would use it's free, in-built XPS tools instead of Adobe's PDF, because everyone hates Adobe, right? Not only did other software companies stay away from XPS support, but Windows users were already heavily invested in the cross-platform PDF format, and who wanted to be even more reliant on Microsoft for something else that's Redmond proprietary anyway. It seems like... no one. So even though Windows 10 still sets the XPS printer driver as the default, almost everyone uses something else - mostly PDF with some XML formats including Open Office files. And while Microsoft standardised XPS, the upgrade to OXPS brought the same issue of forward compatibility as the swtich from .DOC to .DOCX. Which was less than helpful at the time and further reduced XPS' in-roads on the desktop. Microsoft finally gave in to the inevitable user demand in Office 2007 by including a 'save as PDF' option in Word, Excel and Powerpoint, which pretty well stopped XPS in its tracks; as if there aren't enough third party PDF printer drivers and viewers around enabling you to ditch Adobe as well. So while XPS seemed to Redmond to be a great XML-based solution to a page rendering problem that it largely created, the idea came about ten years too late, into a cycle of distrust of Microsoft's motives, and gained no traction. And what are we all still using? PDF.